This former palace dates from the seventeenth century, although it owes its name to one of its nineteenth century occupants: the republican heroine Mariana Pineda de Munoz who opposed the autocratic rule of Ferdinand VII. A true Andalucian Icon, Mariana refused to betray her accomplices during her trial and was sentenced to death. She was executed for treason on May 26th, 1831. 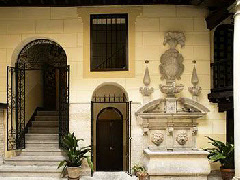 Located in the Albaycin area of the city and opposite the Alhambra, the hotel offers just 5 guest rooms. The city’s cathedral is a short stroll away from the Palacio de Mariana Pineda.